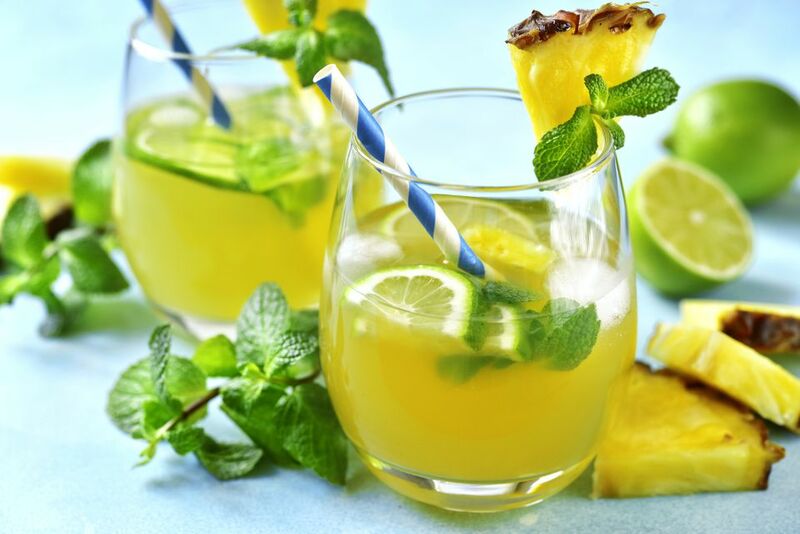 This recipe for pineapple, coconut, lime and mint detox tonic beverage is great for those times you’ve over-indulged in food and drink. It is full of digestion-boosting enzymes, anti-inflammatory phytonutrients, and liver cleansing citrus. Our local gluten-free girl, Katie from the Healthy Cowboy Kitchen, made a tasty tonic for our farmer’s market this year and this recipe is loosely based on her creation. It is light, bright, refreshing, and pretty much guaranteed to kick start your engine! You can make this in a juicer or blender; either way is delicious and the latter has all the plant fiber in it still. ​Pour the coconut water and filtered water into the jar of a blender and add the remaining ingredients on top. Blend on high speed until very smooth. The drink can be strained in a nut milk bag or sieve if you don’t like pulp, but we love this drink as is fresh out of the blender. This juice will hold for 24 hours in the refrigerator. Juice the pineapple, then mint, then lemon and lime, and then apples. Stir the juice together with the coconut water and filtered water and serve. *Raw coconut water can be obtained by cracking open a young coconut. It can also now be purchased at your local health food store thanks to a company called Harmless Harvest. This raw, certified organic, single origin coconut water is not heated, but rather preserved by pressure and must be kept refrigerated. The coconuts all come from Thailand. Delicious Quince Juice Recipe and an Important Point!